1. Coarsely mash 2 ripe avocados in a bowl. 2. 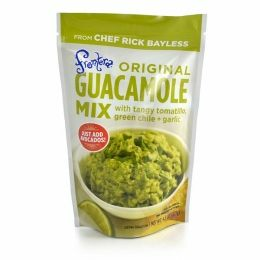 Add Frontera Guacamole Mix. 3. Stir and add salt to taste. Serve with Frontera Tortilla Chips or cut veggies. Ingredients: Roasted tomatillos, tomatoes, green chiles, onions, cilantro, citric acid, salt, evaporated cane juice. Absolutely love this product! Unable to find locally - glad I can easily order on line!! ProsEasy to use and seasoning is perfect!